Luxy is created exclusively for rich men and women looking for serious, long-term relationships. It's more well-known as a popular social dating app on iOS and Android. With an aim to weed out those who belong on a different kinds of dating sites, Luxy is focusing on a smaller but high-social-level group of people. It attracts people rich and famous, from business CEOs to Hollywood celebrities, and even former owners of LA Clippers. Despite of the controversial opinions, Luxy turned out to be an overnight success among all its rivals. The most distinct feature of Luxy is how it pairs people up: They match users based on their favorite luxury brands. "He likes Fendi. I like Fendi. So, it's like we had relationship for 29 years." To possess a common luxury commodity means a common topic to start with, and in the meanwhile, it screens out people who are not on the same wavelength with you. And the fact is only men who make $200,000 or above a year and women who make $100,000 or above annually can enjoy the dating service here. Easy Signup ---- To easily sign up with either a working Facebook account or a functioning Email account. Basic Search ---- To search by filters like age, distance, newest members, hottest members etc. Luxy Brands ---- To allow users to pick out their favourite brands for other members to view. Luxy Tags ---- To allow users to use tag words to best describe themselves. Receiving Roses & Emails ---- To receive Roses & Emails sent by other members. 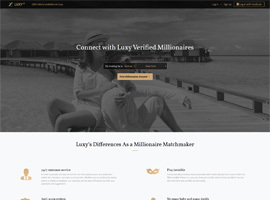 As a millionaire dating site, Luxy offers many more fun and practical features for its paying members. Premium Search ---- To search by filters like income, location, verification status, likes etc. Sending Roses & Emails ---- To send Roses & Emails to anyone you are interested in. Income Level Verification ---- To verify your income level by sending either your bank statement or tax record to the customer service. Luxy was first launched as an App on mobile platform, and the App provides several unique fun features that work the magic. 1. Vouch: For any outsiders who want to join the Luxy club, this might be a fun and interactive way. Existing members on Luxy can choose to vote In or Out the applicants. If the applicant can get more than 50% In votes within 24 hours, then he or she can successfully join the site, enjoy the offered dating services and get access to other features. 2. Play: After joining the site, users will have 3-round per day to use the Play feature. Simply swipe with your finger on the touch screen, towards left to pass on a profile and towards right to show your interest in a profile. For standard members, it's faster than you have expected to use out the 3-time chances. And to obtain more chances to explore further, you might consider getting premium membership. 3. Moments: With this feature, users can upload their photos, possessed luxury items and share their fantastic vacation experiences. Other members can view all these information and click Like button if they are interested. And users will get to know those people who have shown their liking and admirations. Also, users can switch on the real-time positioning, to let nearby users know your whereabouts. 4. Topics: To post either a hot topic or an interesting question will draw a lot of people's participation. At the same time, you will attract more people's attention on your profile and increase your chances of matching. Promo code is also available on the site. By sending the promo code to your friend, you and your friend will both get $10.00 discount once your friend receive the invitation and join the site. Also, standard users can earn credits or coins through friend referral system to unlock premium features like messaging and filtering. Started with the first social dating App created exclusively for attractive, successful men and women looking for a long-term relationship, Luxy is a perfect alternative to the "no limitation, anyone can join and hook-up genre." With its focus on a smaller, more dedicated database, Luxy makes it possible for these successful singles to be safely matched up with others who match their taste, social status and lifestyle.